He was known as the best landscape painter of the Golden age, but died young, only 35 years old. 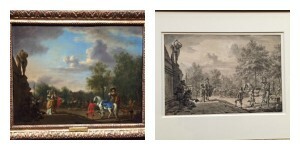 Adriaen van de Velde, 1636-1672, came from a famous family of artists. 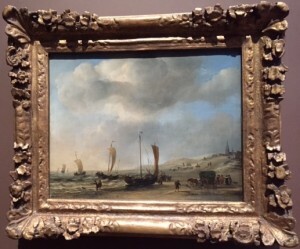 Dad Willem van de Velde (the Elder) was recognized as a skilled marine artist, as was his brother Willem (the Younger). But whilst the works of the two Willem are still celebrated today, this Master of the Dutch Landscape has fallen into oblivion. Time to dust off the out-dated ideals. At Rijksmuseum Amsterdam, in collaboration with the Dulwich Picture Gallery London, his most beautiful and qualitative works are now on show for the first time. And it is a world of beauty we enter. One with vivid colours and warm light, the most exquisite landscape scenes and richly dressed figures, deeply engaging in interesting chats, getting ready for the hunt or spending time at the beach. The beach was a popular scenery for Adriaen van de Velde, whose superb dunes and beaches glow with a special, warm and sunny light. The colourful 'A hawking party setting out', 1660. Oil on panel. “It always feels like a sunny Sunday in his paintings”, as put by curator Bart Cornelis during the opening. Indeed, this was the speciality of Adriaen van de Velde. Sun-drenched southern looking landscapes with shepherds, cows and sheep. And he had a sublime way of doing them. His extreme attention to detail and his masterly way to portray humans and animals alike are well documented and he often helped his dad, brother and fellow artists to paint figures and animals on their canvasses. The opening piece 'Shore at Scheveningen' is an example. Most likely, the two brothers Van de Velde made it together. The green carriage and the slender figures of the boys playing with their dog, is undoubtedly by the hand of Adriaen. His way of painting animals is another marvel. Still today, almost four centuries later, the horses, cows, and goats look so real you expect them to walk out of the frame. Every muscle, bone, fur and eyes, it is insanely real. Check out the cows in the foreground on 'A farm with a dead tree'. 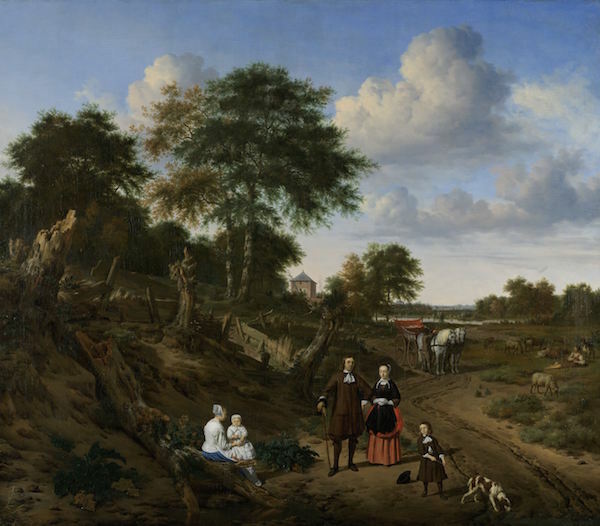 This painting also depicts another typical Adriaen van de Velde-feature: the cobalt blue color of the milkmaid’s skirt. 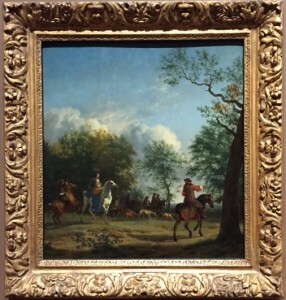 In several other paintings in the exhibition, this clear blue colour appears, a lovely contrast in the green landscapes and hunting scenes. The hunt was of course a great theme for someone so brilliant at depicting animals. In the painting ‘Departure for the Hunt’ from 1662, he has managed to squeeze in no less than 23 dogs and eight horses (!). But the couple in the middle, on their way to mount the saddled horses, catches our immediate attention. White, red, gold, yellow and blue, the colours are ‘exceptionally brilliant, even for Van de Velde’ as stated in the catalogue. Luckily, this exhibition will come to London in October, so you can experience the wonder first hand. Not only is this the first monographic exhibition showing Adriaen van de Velde's works, it is also unique in the sense that few other artists from this era left so much preparations and step-by-step explanations as to how he created the magnificent landscapes. There are several sketches of small and large details of many paintings, making it possible to follow the process. And each of these sketches is a masterpiece of its own, with nature so real you want to stroll along with the shepherds. Seeing these 60 paintings, on loan from the Louvre, the British Museum, the National Gallery and private collections, it’s almost impossible to understand how we could have forgotten his name. But I’m sure this will change now. We certainly need some sunny landscapes to rest our eyes on in these eerie days. Welcome back, master Adriaen van de Velde. Échantillon Lesage pour Jean Patou 1928 Motif floral stylisé géométriquement.